You never get a second chance to make a first impression. Make your first impression a lasting one. Put an Alpha Director in your lobby and provide guests with the information they need at a glance. This contemporary, electronic message center adapts to any environment. Plus, you control the message from a handheld keyboard or your PC. Update and revise your message at a moment's notice. Answer questions before they're asked. The Alpha Director welcomes guests, posts events, and most importantly, keeps your traffic flowing. To ensure continued productivity and preventive safety, to relay real time communication, to manage quality control, to boost employee morale  count on the Alpha Director. The Alpha Director is a versatile indoor LED Sign designed for office and commercial applications. It displays text and graphics in three colors and three rainbow color combinations. The Alpha Director is one of the brightest and sharpest indoor displays available. The Alpha Director is perfect as a lobby sign in any business, casino, health club, hospital, school, airport, train station, bus terminal, convention center, hotel or movie theater. The Alpha Director can be used to display employee communications that build company loyalty, boost morale and encourage teamwork. Display the company stock price, emphasize safety issues, advertise company-wide events, promote cafeteria specials, announce birthdays and anniversaries, and publish production goals and attainment. 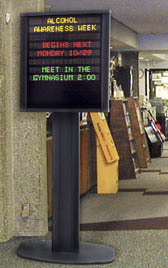 For applications that require multiple LED Signs, any number of Alpha Director displays can be connected together to form an integrated system, along with a computer, displaying important information instantly where it is needed. Messages can be entered using the remote control keyboard that is provided. It is as easy to understand and use as an ordinary calculator. Automode and Autocolor programming features eliminate the need to learn complicated programming procedures. Within seconds, anyone can create attractive visual messages with attention-getting impact. Every Alpha Director is shipped with a remote control keyboard, Alpha Director Messaging Software, 25' RS232 cable, and a User Manual that describes how to setup the display and program it with the remote control keyboard. Messages are enhanced by seven built-in display modes, multiple colors, day, date, time of day and other special features. Eight Lines  The Alpha Director has eight lines. twenty-four 1.4-inch characters per line. (192 characters per page). 26 Message Files  26 different message files containing a combined total of 166 to 250 pages can be stored, scheduled, and displayed according to time and day of the week. TriColor  Text may be displayed in three colors  red, green and yellow  or in three rainbow color combinations. Specifying the built-in Autocolor feature automatically and randomly changes the color of each screen of text. Sans Serif Character Font  Text is displayed in sans serif (block). 1.4" (7 pixels)  upper or lower case are visible up to 75'. Battery Backup  The Alpha Director has battery backup for messages. Messages are retained in memory for up to a month when the Alpha Director is powered off. Sequence Message Files  Message files may be run in any sequence. Message files may be listed more than once in the sequence. Message Scheduling  Each message file can display on its own schedule, automatically turning on and turning off at specified times on specified days without human or computer intervention. Each message file can be programmed with the day and time to start running and the day and time to stop running. Daily recurring messages, such as Lunch Time Specials and Coffee Break Specials or messages coordinated with public transportation arrival and departure schedules, can turn on and turn off at the appropriate times each day. Safety-oriented messages, such as "Lift With Your Legs, Not With Your Back" or "Don't Forget To Wear Your Safety Goggles" can be scheduled to display at different times, instead of at the same time, to achieve maximum effect and variety. Password Protection and Message Locking  These features are provided to prevent unauthorized messages or changes to messages in the Alpha Director. Wipe (Up, Down, Left, Right)  Characters are revealed as each horizontal row or vertical column of pixels is lighted row by row or column by column  from the top row of the character down (Wipe Down), from the bottom row of the character up (Wipe Up), from the left column of the message to the right (Wipe Right), or from the right column of the message to the left (Wipe Left). Flash  Characters blink on and off simultaneously several times. Six Speeds  The Alpha Director has six Speed codes that control how long characters stay on the display in Hold mode and how long characters stay on the screen in the various Wipe and Flash modes. Automatic Message Centering  Messages are automatically centered on the Alpha Director display in all display modes, except when the Fixed Characters code is used. The Fixed Characters code left-justifies messages, and uses fixed (equal) character spacing from left to right. The primary use of the Fixed Characters code on the Alpha Director is to display similar fields of data on consecutive screens in the same pixel positions. Real-Time Clock  The Alpha Director has a built-in, battery backed up real-time clock. The time and date (day, month, year) can be set using either the remote control keyboard or using a computer with software that sends the computer's time and date to the Alpha Director. The day, date and time are retained in Alpha Director memory for up to a month when the unit is powered off. 12- or 24-Hour Time Display  The Alpha Director can display the time of day in either 12-hour or 24-hour format. Computer Connection  The Alpha Director may be attached to a wide variety of computers, control equipment and communication devices. Supports Multiple Communications Protocols  The Alpha Director supports multiple communication protocols. RS232 and RS485 and two RJ11 attachment ports are standard features. Ethernet and POCSAG attachment options are also offered. Numerous cable, network, wireless and modem connectivity options are supported by the Alpha Director  click here for more information. Address Each Display  Each Alpha Director can be given a unique address, so that messages and data may sent by computer or control devices to different displays on the same cable, wireless channel, modem phone number or TCP/IP address. 255 addresses are available, and the Alpha Director address may be set or changed easily with the remote control keyboard or using a computer and special software. The Alpha Director enclosure does not have to be opened. Message Verification and Error Checking  Built-in features ensure that messages are received accurately when a computer or control equipment sends messages or data to the Alpha Director by cable. Non-Blinking String File Updates  The Alpha Director supports "String Files" and real-time updating of String Files without blinking the messages displayed on the sign. String files are memory areas set aside in sign memory by special programming. One use of String Files is to store changing data being updated by an external device or computer. For example, the Alpha Director could be programmed to display five (or more) ACD statistics fields for each of ten (or more) ACD queues. As the real time values change for each of the 50 variables (5 x 10), the updated values can be transmitted into the Alpha Director instantly, without causing the Alpha Director to blink and without affecting the information currently being displayed. String Files can also be used to save sign memory. For example, if the same data is displayed multiple times within a message, the data can be stored once in a String File and recalled from its String File location each time it is needed. Clear Memory Easily  When debugging and testing software and messages features, the remote control keyboard can be used to clear the memory of the sign quickly and conveniently, without opening the Alpha Director enclosure or taking it down from where it is mounted. Clearing memory removes all messages, graphic files and the password that have been programmed into the Alpha Director. Supports Wireless Applications  The Alpha Director supports POCSAG or pager transmission format. It can be programmed for wireless applications. Wireless News and Sports Service  The Alpha Director can be equipped with a wireless broadcast receiver that will display the latest news headlines, financial market summaries, sports information and scores, in addition to your own messages. The receiver and news service are extra charge options. Update Firmware Easily  When new features or firmware improvements for the Alpha Director are announced by Adaptive Micro Systems, firmware upgrades may be purchased and easily installed. Alpha Director firmware is provided on a chip conveniently mounted in a chip carrier that literally snaps into a socket inside the Alpha Director enclosure under a hinged door. Programming Manual  A programming manual describing how to use the remote control keyboard is provided. It is well-written, well-organized and easy to use. It includes tutorial exercises and feature reference tables. The Alpha Director User Manual may be downloaded at no charge by clicking here. Technical Assistance and Support  Customer assistance for installation issues and technical support is provided by Alpha-American Programmable Signs at no additional charge. 120V or 230V  The Alpha Director is completely solid-state. It has a removable power cord, and it plugs into a standard 120V AC electrical outlet. 230V AC model also available. Attractive Enclosure  The Alpha Director can be ordered with either an oak or aluminum cabinet that will compliment any business environment. The floor stands are black, anodized aluminum. Mounting Hardware  Floor stand models are mounted on an aluminum floor stand. Wall mount models come with wall mounting hardware. Brochure Rack -- The oak floor stand model includes a brochure rack. Two Year Warranty  The Alpha Director has a one-year USA factory warranty. Alpha-American Programmable Signs extends the warranty an additional year for our customers. After the two-year warranty expires, the Alpha Director will be repaired and returned for flat rate. Power: 120 VAC, 60 Hz, 180 watts max or 230 VAC, 50 Hz 150 watts max. Case Material: Solid oak, extruded aluminum, and combination of oak and aluminum. 16-Character Director, Oak Enclosure, Wall Mount: 37 lbs (16.78 kg) including display, power cord and remote control keyboard. 16-Character Director, Aluminum Enclosure, Wall Mount: 30 lbs (16.64 kg) including display, power cord and remote control keyboard. 24-Character Director, Aluminum Enclosure, Wall Mount: 40 lbs (18.18 kg) including display, power cord and remote control keyboard. Networking Alpha Signs - Networking methods, network interfaces, messaging software options, and an extensive glossary.